What started as an experiment more than two decades ago that involved putting beer into bourbon barrels has evolved into selecting a limited edition single barrel bourbon release. Any beer enthusiast is familiar with Goose Island Brewery’s famed Bourbon County Stout, the result of an experiment by former head brewer Greg Hall. The beer has taken on something of a legend status since it was first created in the mid-1990s, and that popularity has in recent years led the brewery to create annual variants, from flavor-infused versions of the imperial bourbon-barrel stout to single-barrel versions. 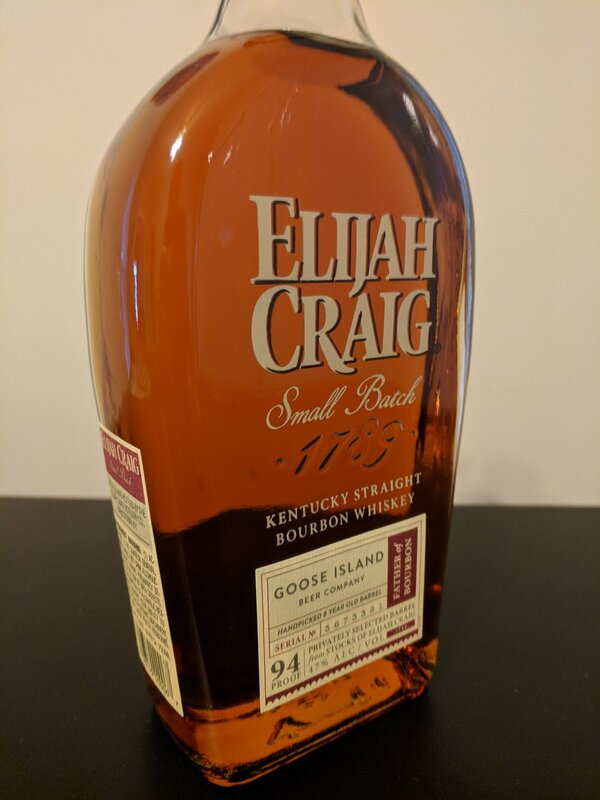 The brewery’s barrel broker offered up some 12 Year Elijah Craig barrels from Heaven Hill Distillery, a first for Bourbon County Stout, and the two entities decided to co-brand the resulting beer to create 2018 Bourbon County Stout Reserve. And so, the Goose Island team traveling to Bardstown, Ky., to do some barrel-picking, all while filming a documentary about the legendary beer. The idea arose to partner on another project while the Goose Island representatives were on site, to do a co-branded release of small-batch, hand-picked Elijah Craig bottles. The distillery picked out 10 barrels for the Goose Island team to taste as a process to select five for bottling. “We’re huge fans of that bourbon, regardless,” Mike Smith, a certified bourbon steward for Goose Island’s education program who describes himself as the brewery’s “barrel guy.” So, to be able to do a co-branded version with Heaven Hill, he said, was something of a no-brainer. Of course, choosing the barrels—five were bottled, aged eight, 10 and 11 years, respectively—was the fun part. Smith said the parties tasted their way through all 10 barrels back to back, which was “a pretty big feat.” Smith and head brewer Mike Siegel, working with then-Heaven Hill master distiller Denny Potter (who has since moved on to Beam Suntory), learned on the fly how to taste bourbons back to back and to distinguish the unique flavor profiles of each. “It really was kind of bettering our sense of how to drink bourbon and look for the nuances from barrel to barrel, and the differences,” he said, adding that there was footage shot of the tasting that didn’t make the documentary. I was afforded a sample of some of the 11 year-old and found it to be just as Smith described it to me, with plenty of dark fruits and caramel in both the nose and flavor profile. I also found hints of cinnamon in that batch, with requisite oak, char and a smooth finish. It’s kind of a full-circle story, if you will.